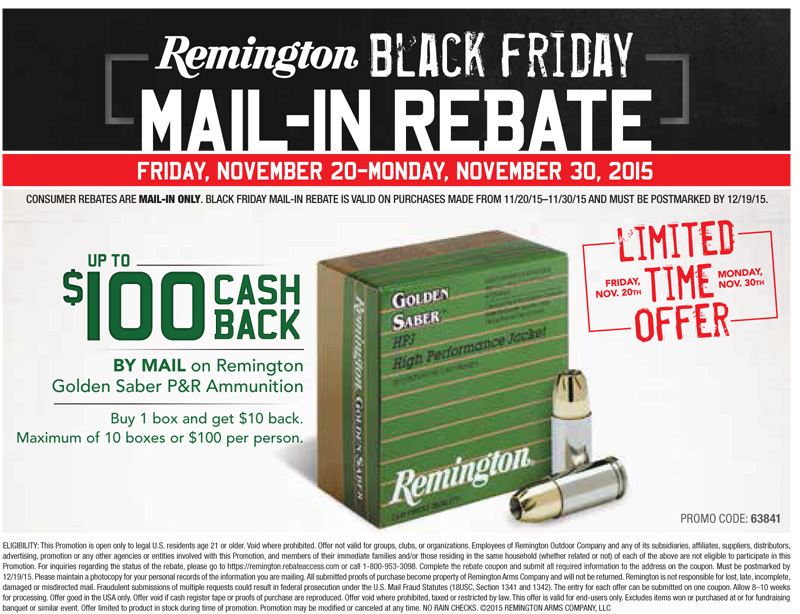 Purchase a case (20 packs each containing 25 rounds) of Golden Saber Ammo from Osage County Guns between 11/20/2015 through 11/30/2015 and receive the full $100 Cash Back by mail from Remington! Click HERE to download the rebate form. All rebate requests must be postmarked by 12/19/2015. See the bottom of the rebate form for restrictions and details. At the heart of Golden Saber HPJ™ is a high-performance hollow point bullet with a jacket made entirely of cartridge brass - not copper gilding metal. Thicker and stiffer than other bullet jackets, Golden Saber HPJ™ releases energy over a longer distance. And, unlike conventional hollow point bullets, the jacket is nose cut completely through, promoting controlled expansion to well over 1.5 times the bullet's original diameter. The nose cuts, configured in a new, patented spiral pattern, produce larger petals and reduce the nose cavity for optimized mush performance. Over a wide range of velocities, Golden Saber delivers virtual 100% weight retention. The precise hollow point cavity design also maximizes penetration by minimizing lead core deformation. And our Golden Saber Bonded bullets set the standard for barrier penetration performance, especially through auto glass. It all adds up to the kind of knockdown performance lives may depend on.